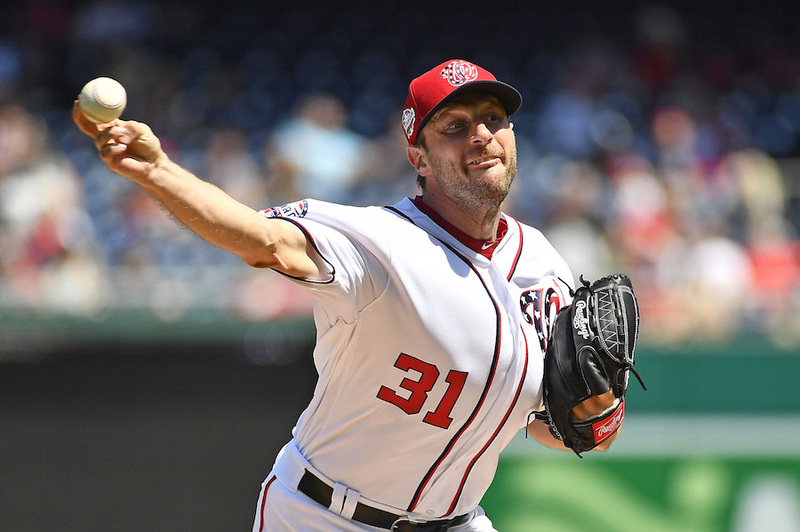 After allowing a four-pitch walk to Gerardo Parra and a two-run home run to Charlie Blackmon in the first inning, Washington Nationals right-hander Max Scherzer went on to retire 20 consecutive Rockies hitters on Saturday to help deliver a 6-2 Nationals win. The three-time Cy Young winner now leads the National League in both wins (3) and strikeouts (38). Scherzer was simply dominant against a Rockies lineup that was without Nolan Arenado, who began serving the five-game suspension handed down for his actions in a brawl with the San Diego Padres on Wednesday. Scherzer improved to 3-1 on the season, striking out 11 hitters and issuing just the one walk to Parra and the home run to Blackmon. Rockies Manager Bud Black suggested postgame that Colorado was caught somewhat off guard by the 33-year-old’s velocity, despite Scherzer’s reputation as one of the best in the game. Scherzer touched 96.6 mph on a pitch to Tony Wolters, a 3-2 fastball up in the zone that resulted in a fly out to left field. Of the 10 balls put into play against Scherzer and tracked by Statcast on Saturday, only two of them had an exit velocity of greater than 90 mph — the Blackmon home run and a groundout off the bat of pitcher Jon Gray. The loss evened the Rockies’ record at 8-8, while Washington moved to 7-8. Colorado, who won the first two games of the four-game weekend series, will need to beat another Nationals pitcher with the ability to shut down a lineup, Stephen Strasburg, on Sunday to steal a series win. Tyler Anderson pitches for Colorado.